Home » Certified Products » Where Does My Money Go? Where Does My Energy Go? 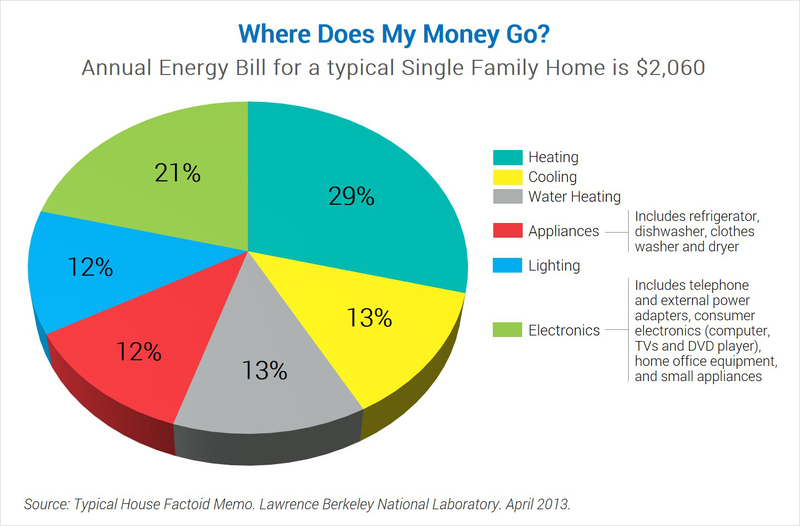 Annual Energy Bill for a typical Single Family Home is $2,060. Heating - 29%, Cooling - 13%, Water Heating - 13%, Appliances - 12% (includes refrigerator, dishwasher, clothes washer and dryer), Lighting - 12%, Electronics - 21% (Includes telephone and external power adapters, consumer electronics (computer TVs and DVD player) home office equipment, and small appliances). Source: Typical House Factoid Memo. Lawrence Berkeley National Laboratory. April 2013.